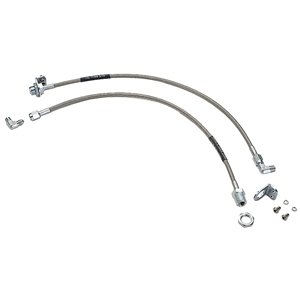 The brake lines are 18" long; DOT-approved; stainless-steel-covered; and Number-3-Teflon-lined. Includes Number 3-to-1/8"-NPT 90-degree adapter for caliper; 3/16" SAE female inverted flange for frame end. Frame-mounting bracket and stainless hardware are provided.